The EPA's findings about fracking's contamination of ground water have sent a shockwave through a gas industry in denial. Thursday's stunning announcement from US EPA that implicates hydrofracturing ("fracking") as the cause of groundwater contamination in Pavillion, Wyoming is news that has rocked the world. But as groundbreaking and innovative as the investigation has been, the news comes as no surprise to anyone who has been following fracking closely. Anyone who lives in a gas drilling area can tell you: fracking contaminates groundwater. Citizens have been shouting this at the top of their lungs in fracking areas since shortly after the process of hydraulic fracturing was exempted from the Safe Drinking Water Act in 2005, paving the way for the largest gas drilling boom in domestic history. The exemption, known as the "Halliburton Loophole", allows fracking companies to inject toxic chemicals under the ground in huge quantities and not report it to the EPA. But with this much fracking going on, with thousands of wells being drilled and fracked in 34 states, and with thousands of reported cases of contamination, the gas industry just can't keep their secrets buried; they keep bubbling up through the ground. Since April 2009, I have been documenting the water contamination in the gas fracking field in Pavillion, Wyoming. The testimony of Pavillion cowboys John Fenton, Louis Meeks and Jeff Locker and their incredible families is some of the most stirring in our film Gasland. Since that time, I have been closely following the extensive three-year EPA investigation, and the results have shown over and over again that there were contaminants in the groundwater, which posed a significant health risk to the residents. Yet the EPA withheld any language that sounded conclusive - until now. When the whole world is watching, when the gas industry is decrying a lack of science (even as they obstruct and smear the science that has been done), and when the health of the state of New York, alongside significant areas in 34 states and 50 countries worldwide is on the line, you want to make sure that your methods are precise and your statements are conservative. So, when the EPA now says, "When considered together with other lines of evidence, the data indicates likely impact to groundwater that can be explained by hydraulic fracturing," that is something quite new. What is also clear is that the aquifer in Pavillion will never be cleaned. The contamination there, for the foreseeable future, is permanent. And considering that the permanent contamination of huge areas of groundwater in the US is now a scientifically proven risk, the Pavillion investigation, as extensive as it was, must become the new standard for investigating fracking complaints worldwide. Having investigated fracking myself for three years, I have heard the same story hundreds of times, from residents in gas-drilling areas from Wyoming to Arkansas, from Pennsylvania to Texas. It goes like this: the frackers move in - and all of a sudden your water turns color, or can be lit on fire, or smells like turpentine or leaves burn marks on you after you take a shower. It doesn't take a genius to connect the dots. And when reading EPA's water tablature from Pavillion, the notes are really familiar: a minor key refrain of benzene, xylene and other volatile organics, modulation over to glycol ethers and other chemicals in the antifreeze family, a bang-up chorus of thermogenic methane and a killer hook of acetone, naphthalene and 2-butoxyethanol. In fact, three days ago, practically the same list of fracking chemical ingredients found in Pavillion's water were found in water tests from Dimock, Pennsylvania - another poster town for fracking contamination of groundwater. In Dimock, PA, like Pavillion, citizen's water went bad right after drilling and fracking moved in. Yet, the state agency, PA DEP, and the governor, Tom Corbett, have sided with the gas companies - and they deny any responsibility or long-term harm. The EPA must intervene in Dimock immediately. An extensive study should be conducted there, with the same careful, methodical and thorough science that was employed in Pavillion. And while that study is conducted, the EPA should mandate that Cabot Oil and Gas supply the residents with replacement water; and the drilling moratorium in the area should continue. It is hard to prove something that is happening thousands of feet below the ground. It's very difficult and costly, both in time and money. To prove that fracking has contaminated water, even as obvious as it can be to residents who can see the apparent cause and effect, takes extensive and expensive hydrogeological study. Hundreds of chemicals need to be tested over a period of years in a large sample area. In Pavillion, nearly 50 water wells were sampled, two deep monitoring wells were drilled and years of working with the immense pool of data was required. After viewing the EPA draft study (pdf), no one can ever again say that robust science has not been brought to bear on fracking. But the trail doesn't end there. The gas fracking industry has been so poorly regulated for so long, the legacy of contamination and obfuscation has been allowed to run unchecked for so many years, that the EPA and the United States now faces a Herculean task of investigating the thousands of cases that mirror Pavillion and Dimock - from Texas, to Louisiana, Colorado, Arkansas, Michigan, New Mexico and more. Beyond the US, Europe, South Africa, China and Australia are right now contemplating embarking on the "shale gas revolution"; they should take note of the EPA's findings. As the story unfolds, the real answer bubbles inexorably to the surface: fracking is deeply flawed; it is inherently contaminating in its present form and must be halted immediately. The empty excuses of the gas industry and the pro-fracking politicians who defend them just don't hold water. YOUNGSTOWN, Ohio — Until this year, this Rust Belt city and surrounding Mahoning County had been about as dead, seismically, as a place can be, without even a hint of an earthquake since Scots-Irish settlers arrived in the 18th century. But on March 17, two minor quakes briefly shook the city. And in the following eight months there have been seven more — like the first two, too weak to cause damage or even be felt by many people, but strong enough to rattle some nerves. “It felt like someone was kicking in the front door. It scared the stuffing out of me,” said Steve Moritz, a cook who lives on the city’s west side, describing the seventh quake, which occurred in late September. It was the strongest one, with a magnitude of 2.7. Nine quakes in eight months in a seismically inactive area is unusual. But Ohio seismologists found another surprise when they plotted the quakes’ epicenters: most coincided with the location of a 9,000-foot well in an industrial lot along the Mahoning River, just down the hill from Mr. Moritz’s neighborhood and two miles from downtown Youngstown. At the well, a local company has been disposing of brine and other liquids from natural gas wells across the border in Pennsylvania — millions of gallons of waste from the process called hydraulic fracturing that is used to unlock the gas from shale rock. Nearly half of the landowners who have leased their ground to shale gas developers in the north-east of America regret doing it, despite the money, according to a new report by Deloitte. In findings that will intensify opposition to the controversial process of hydraulic fracturing, some 47 per cent of respondents in the "new shale" states of Pennsylvania and New York, who have rented out their land, said they wouldn't repeat the experience. Meanwhile, 48 per cent said they would advise family and friends against leasing their land for "fracking", a process which blasts sand, chemicals and water into shale rocks to release the oil and gas they contain. Fracking has become increasingly controversial in recent months, as the process was found to have caused earthquakes in Oklahoma in the US and near Blackpool inthe UK. A report by the US Environmental Protection Agency (EPA), disclosed in The Independent last week, linked fracking and water pollution for the first time, prompting the shadow Energy Minister, Tom Greatex, to demand a full investigation into the technique. But analysts say the Gasland documentary, which was nominated for an Oscar this year, has probably done the most to inflame opposition. In one scene, residents of Dimock, a small community in the heart of Pennsylvania's fracking industry, blamed the process for polluting their tap water with so much methane that they could light it. Fracking has been banned in New York, although the move is being reviewed, but the practice continues in Pennsylvania. While opposition to fracking is mounting in the US, many politicians are in favour of extracting America's plentiful supply of shale gas, which is dragging down household utility bills and reducing its reliance on energy imports from dubious regimes. China's Sinopec and France's Total have announced deals worth nearly $US5 billion that would have brought a smile to Mike Yeager's face. Last year the BHP Petroleum chief executive plunged nearly $US20 billion into a massive US shale gas play that has generated considerable scepticism, in terms of both its economics but more particularly its politics. Around the world the 'fracking' process used to release unconventional reserves of oil and gas is producing intensifying controversy among communities concerned about contamination of aquifers and a growing conviction that the process - which involves injecting water, sand and chemicals into drill holes to release the oil and gas - is inducing seismic activity. Only last week Ohio froze drilling in its north-western region after a series of small earthquakes amid fears that they had been triggered by fracking. Last year the UK halted drilling by Australian group AJ Lucas near Blackpool after 50 seismic events. Despite those concerns Sinopec, China's second-largest oil company, and Total, one of the world's biggest energy groups, have ploughed billions more into US shale gas. The two companies already had positions in the sector in the US and are also major investors in the Australian coal seam gas sector - Sinopec is a shareholder and the core customer for the Origin Energy/ConocoPhillips APLNG project and Total is a major shareholder in the Santos/Petronas GLNG project and a customer. The decision by Sinopec to invest $US2.5 billion in five new development projects with Devon Energy of the US and by Total to spend $US2.3 billion to buy into an Ohio joint venture with Chesapeake Energy (which sold BHP its original shale gas beachhead last February) and EnerVest can only be interpreted as a vote of confidence in the future of the sector despite low gas prices and rising community opposition. The issues raised by shale gas and coal seam methane are slightly different, with the major worry about coal seam methane its potential impact on groundwater, given that the coal beds tend to be at relatively shallow depths. With shale gas, while there are also concerns about the impact on aquifers, reservoirs tend to be at depths well below aquifers and the primary concern is the connection between fracking and seismic activity. BHP has been relatively unconcerned about the environmental issues raised by fracking, although it did voluntarily plug and abandon two water injection wells in Arkansas last year because of fears that they may have been related to earthquakes in the region. It has pointed out, however, that not only has the shale gas industry in the US been operating for decades but that there was recorded earthquake activity in regions where drilling for shale gas is now occurring decades before there was a US shale gas sector. Another point often made by the sector is that until very recently the sector was the province of junior companies. It is only very recently that the big energy companies started moving into the sector - the landmark transaction was Exxon's $US30 billion acquisition of XTO Energy only two years ago. Development of shale gas reserves requires very significant amounts of capital, beyond the capacity of smaller players, which created the opportunity for the majors to move into the sector. The big companies have a conviction that their financial and technical capabilities will enable them to better deal with the environmental issues. The investments by Sinopec and Total have been made despite the impact that the boom in shale gas activity has been having on gas prices in the US, where they fell nearly 30 per cent last year. The majors appear to take the view that the centrality of gas to the long-term energy security of the US, the ability to leverage the existing extensive gas pipeline infrastructure, the potential for exports of LNG and their own ability to steadily improve the economics of producing the gas will produce a validation of their investments over the longer term. For BHP, the continuing big investments by global energy heavyweights in the sector will buttress its confidence and that of its investors that the $US20 billion bet on the future of shale gas in the US will eventually produce a reasonable pay-off and a reward for the risks of being a relatively early mover at the big end of the sector. After earthquakes in Lancashire and tales of poisoned water and flaming taps in the US, "fracking" for gas or oil in the English home counties was never likely to be easy. And so it proved when oil executives faced the fury of a village hall full of West Sussex residents in a clash over controversial technology that energy companies believe could open up major reserves of energy from underground rocks. "What you are about to do will make our water beyond toxic!" Ella Reeves shouted at Mark Miller, the Pennsylvania oil man who had come to Balcombe to explain plans to search for hydrocarbons 800 metres under the Sussex weald. "It's about money for you, but for me it is about life." Reeves was one of around 200 residents squeezed into the village's arts and crafts village hall to hear Miller, the chief executive of Cuadrilla, a multinational oil and gas company, explain why he might want to use hydraulic fracturing or "fracking" less than a mile from the village, which lies on the London to Brighton commuter line, just five miles from Gatwick airport. The technique involves forcing thousands of gallons of chemical solution under high pressure into rocks to release oil or gas, but opponents say it pollutes groundwater, adds to greenhouse gas pollution and destroys local ecosystems. The meeting on Wednesday night was the latest skirmish in the battle between environmentalists and the oil and gas industry over access to the UK's shale gas and oil reserves, which in Lancashire alone could deliver £6bn a year for 30 years, according to one industry estimate. Supporters say it will improve the UK's energy security and the battle has intensified in recent months with anti-fracking activists scaling a rig in Hesketh Bank, Lancashire, halting work in November. Balcombe laid on a more polite welcome, but after two earth tremors near Blackpool last year were attributed to Cuadrilla's fracking operations, the atmosphere was tense. A warm-up video screened by the meeting organisers about the toxic impact of the technique in America, raised the temperature to furious. Miller and his two PR minders, all dressed in black, gritted their teeth as the film spoke of "red nasty water oozing out of the hill", "radium in waste products", "methane in drinking water" and how "our heaven has turned into our hell". Fracking "threatens to destroy the environment and wreck lives", the voiceover said, adding frightening claims that the chemicals used in the US had been linked to bone, liver and breast cancers and disorders of the nervous system. "I am going to be following a bit of a tough act with that video," said Miller as he took the microphone nervously. "I'm not sure I can." He managed to explain that his company has acquired an exploration and development licence from the Department of Energy and Climate Change and that it only planned to drill a test well at this stage. He said the pollution suffered in parts of America, where the fracking industry is huge and growing, represented "the poorest part of our industry". "Drilling and fracturing for natural gas is safe," he said to disbelieving tuts. "It about doing it right. Environmental incidents are rare." By this point some in the audience wanted to hear no more. There were shouts of "you've gone on long enough" and "you're talking rubbish". Anti-fracking campaigner Will Cottrell, chairman of the Brighton Energy Co-operative, claimed a 10-well fracking facility was "like setting off a 4.4 kilotonne nuclear bomb". Quadrilla said this was untrue, but the hall was in foment. "You are in Sussex now and we will not be drove [pushed around]," shouted Alan Gold, 67. "If you put fracking fluid down there at 10,000 pounds per square inch it is going to disturb our drinking water," yelled another man. "Go away!" "Frack 'em and forget 'em, isn't it?" said a voice from the back. "It's all about the money." "This is how they burn witches I guess," Paul Kelly, a director of PPS, Cuadrilla's public relations and lobbying firm told the Guardian. "I can think of dozens of oil companies who wouldn't put themselves through this in a million years and maybe they have it right." "It has been pretty disastrous," added Nick Grealy, a former gas executive who promotes the shale gas industry for clients including Cuadrilla. "They were set up." For many residents this was the first they had heard of the plans and they voiced worries about the millions of gallons of water needed for the operation in a drought affected area, noise and water pollution. Two young women spoke about their fears fracking would hinder their recovery from cancer. Miller said the fracking technology used in the UK was designed to prevent pollution of water courses. He repeatedly said the well was only at exploration stage and that a further licence would be needed for extraction. He said the chemical used in the fracking solution was not carcinogenic. Just one resident, retired Rod Jago, spoke up in Miller's defence. "Surely we should welcome any contribution to self-sufficiency provided it is safe," he said to gasps of disbelief from some of his neighbours. "All new technologies have teething problems. We wouldn't have trains or aeroplanes if we had meetings like this when they started." A spokesman for Cuadrilla, whose backers include former BP chief executive Lord Browne, said said it was pleased to have been allowed the platform. "We couldn't answer all the questions and there was a great deal of confusion about some of the claims that were being made about America," he said. "In the European Union there are some very rigorous controls on groundwater pollution." Starting Feb. 1, drilling operators in Texas will have to report many of the chemicals used in the process known as hydraulic fracturing. Environmentalists and landowners are looking forward to learning what acids, hydroxides and other materials have gone into a given well. But a less-publicized part of the new regulation is what some experts are most interested in: the mandatory disclosure of the amount of water needed to "frack" each well. Experts call this an invaluable tool as they evaluate how fracking affects water supplies in the drought-prone state. Hydraulic fracturing involves injecting water, sand and chemicals into underground shale formations at enormous pressure to extract oil and natural gas. Under the new rule, Texans will be able to check a Web site, fracfocus.org, to view the chemical and water disclosures. "It's a huge step forward from where we were," Amy Hardberger, an Environmental Defense Fund lawyer, said of the rule. Most fracked wells use 1 million to 5 million gallons of water over three to five days, said Justin Furnace, president of the Texas Independent Producers & Royalty Owners Association. A June study prepared for the Texas Water Development Board suggested that less than 1 percent of the water used statewide went into fracking. Oil and natural gas groups say such numbers show their usage lags well behind that of cities. But the data cited is a few years old, and drilling has since increased in places like the Eagle Ford Shale in South Texas. The amount of water used for fracking is "expected to increase significantly through 2020," according to the state water plan published this month. Dan Hardin, the water board's resource planning director, said water use for fracking was not expected to exceed 2 percent of the statewide total. But drilling can send water use numbers much higher in rural areas, Dr. Hardin said. For example, he projects that in 2020, more than 40 percent of water demand in La Salle County, in the Eagle Ford Shale, will go toward "mining," a technical term that in this case means almost entirely fracking. Until recently, no water went toward mining there. Researchers say predicting future water usage for drilling is tough, citing economic and technological uncertainties. Meanwhile, they want more data. Dr. Nicot would like to see more information about whether the water comes from aquifers or reservoirs, or has been recycled from other fracking operations. Texas also needs better information about what is in water that has been in the earth and comes up in a well in addition to oil or gas, said Mark A. Engle, a geologist with the United States Geological Survey's Eastern Energy Resources Science Center. That water can contain materials like grease and radioactive elements. "Texas ranks pretty much dead last of any state I've worked with for keeping track of that sort of data," Dr. Engle said. Undeterred, oil services companies including Baker Hughes and Schlumberger are continuing their quest to devise ways to create longer, deeper cracks in the earth to release more oil and gas. These companies are no longer content to frack - they want to super frack. High crude prices and newly accessible oil and gas embedded in shale rock in North America are driving the wave of innovation. The more thoroughly that petroleum-saturated rock is cracked, the more oil and gas is freed to flow from each well, raising the efficiency - and profit - of the expensive process. For example, the growing use of movable sleeves, a tubelike device with holes that fits inside a well bore, lets drillers target multiple spots to dislodge entrapped oil. This technique can reduce the $2.5 million startup cost of a fracking well near the Canadian border by up to two-thirds, according to a recent analysis by JPMorgan Chase. Multiply such savings by hundreds of wells added in that area each year, and you start to understand why the industry is so eager to hone the process. "I want to crack the rock across as much of the reservoir as I can," says David A. Pursell, a former fracking engineer who's now an analyst at Tudor Pickering Holt in Houston. "That's the Holy Grail." Baker Hughes has set its sights on creating "super cracks," a method of blasting deeper into dense rock to create wider channels. The aim of the technology, branded as DirectConnect, is to better concentrate the pressure of fracking fluids to reach oil or gas farther from the well bore, which existing methods fail to do as effectively. The company also is trying to speed up the fracking process. Wells usually are fracked in steps, as plastic balls are dropped down to plug the well at various stages and isolate different zones for fracking. It can take days to get a drilling rig to the site and fish out conventional frack balls, which can get stuck over the course of 20 or 30 preparation phases in a typical well before production can begin. With land-based rigs renting for up to $30,000 a day, reducing such delays is critical. So Baker Hughes has developed disintegrating balls, which turn into powder "like an Alka-Seltzer" after a couple of days, says Rustom Mody, vice-president for technology. Halliburton, the No. 1 provider of fracking services, also based in Houston, is trying to reduce the amount of materials and labor used on each well. It's rolled out RapidFrac, a series of sliding sleeves that open throughout the horizontal well bore to isolate zones for fracking. Fracking fluid is then injected at high pressure through multiple holes exposed by the sliding sleeve, cracking the surrounding rock. The process can be faster and cheaper than the most popular fracking method, which involves sending an explosive charge down the well to blast one hole at a time. The critics aligned against fracking, let alone super fracking, aren't impressed. "If critics already think fracking is bad, theoretically, super fracking would be super bad," says Kirk Sherr, president of Regester Larkin Energy North America, an industry consultant. Doctors attending a fracking conference in Arlington, Va., in early January called for a federal moratorium on the technique in populated areas until the health effects are better understood. Meanwhile, the U.S. Environmental Protection Agency is studying whether fracking can contaminate water resources. The technique also has raised concerns about excessive water consumption because of the millions of gallons needed to frack each well. And local officials in Texas, Oklahoma, Arkansas, and Ohio have voiced concerns about recent outbreaks of small earthquakes in areas where drilling has been accelerating. Seismologists and academics doubt that fracking itself has caused the quakes. "The fracturing process is not causing the problems that are perceived by the public," says David B. Burnett, director of technology at Texas A&M University's Energy Institute. He also says the wider or deeper fractures that result from super fracking won't create bigger environmental problems. "No change in fracturing technology would change that," he says. However, a 2010 study by seismologists at Southern Methodist University and the University of Texas at Austin found that the injection underground of wastewater from the wells may be affecting subterranean pressures in the rock, triggering tremors. Says Amy Mall, senior policy analyst at the National Resources Defense Council: "Just like any other type of fracking, we need a lot more independent scientific data and research to understand the risks and how best to prevent them." Yet as long as high oil prices create big profit incentives to pursue extraction techniques beyond conventional drilling, energy companies likely will continue to explore ways to squeeze money from rocks. Far below this rippling wealth there’s a vast, rocky netherworld called the Marcellus Shale. Stretching through southern New York, Pennsylvania, Ohio, and West Virginia, the shale contains bubbles of methane, the remains of life that died 400 million years ago. Gas corporations have lusted for the methane in the Marcellus since at least 1967 when one of them plotted with the Atomic Energy Agency to explode a nuclear bomb to unleash it. That idea died, but it’s been reborn in the form of a technology invented by Halliburton Corporation: high-volume horizontal hydraulic fracturing -- “fracking” for short. Up comes the methane -- along with about a million gallons of wastewater containing the original fracking chemicals and other substances that were also in the shale, among them radioactive elements and carcinogens. There are 400,000 such wells in the United States. Surrounded by rumbling machinery, serviced by tens of thousands of diesel trucks, this nightmare technology for energy release has turned rural areas in 34 U.S. states into toxic industrial zones. Shale gas isn’t the conventional kind that lit your grandmother’s stove. It’s one of those “extreme energy” forms so difficult to produce that merely accessing them poses unprecedented dangers to the planet. In every fracking state but New York, where a moratorium against the process has been in effect since 2010, the gas industry has contaminated ground water, sickened people, poisoned livestock, and killed wildlife. Around four years ago, sheltered by Patterson's stay against fracking, little discussion groups began in people’s kitchens, living rooms, and home basements. At that time, only a few activists were advocating outright bans on fracking: the rest of the fledgling movement was more cautiously advocating temporary moratoria. Since then a veritable ban cascade has washed across the state. And in local elections last November, scores of anti-fracking candidates, many of whom had never before run for office, displaced pro-gas incumbents in positions as town councilors, town supervisors, and county legislators. As the movement has grown in strength and influence, gas corporations like ExxonMobil and Conoco Philips and Marcellus Shale corporations like Chesapeake Energy have spent millions of dollars on advertising, lobbying, and political campaign contributions to counter it. When news reports about fracking started appearing, the Slottjes thought about leaving. “I kept saying, ‘What’ll happen if fracking comes to New York? We’ll have to move.’” “Drilling 101” made her reconsider. Then she visited Dimock, Pennsylvania, 70 miles southeast of Ithaca and that sealed the deal. “There was a lot of education going on in Ulysses at the town board and at forums, as we were going house to house. Even people who would sign the petition would say, ‘Tell me a little bit more about it.’ And in that next 15 to 20 minutes you would do a whole lot more education.” In the end, 1,500 out of 3,000 registered voters signed. This past summer the Ulysses town board voted to ban fracking. Middlefield, 119 miles east of Ulysses and home of the grassroots group Middlefield Neighbors, enacted a similar ban. So did Dryden, 22 miles east of Ulysses. An out-of-state gas corporation that leased land for drilling in Dryden is suing to get the zoning ban declared illegal. A Middlefield landowner is suing that town on the same basis. The cases are pending. Ellen Cantarow’s work on Israel/Palestine has been widely published for over 30 years. Her long-time concern with climate change has led her to explore, at TomDispatch, the global depredations of oil and gas corporations. Many thanks to Robert Boyle, sometimes called “the father of environmentalism on the Hudson,” for sharing his expertise for this article. Whistleblower Simone Marsh is to be commended for bringing into question the environmental impact assessment scheme in Queensland, which is supporting the headlong development of more than $70 billion in mines, railways, pipelines and port developments. Common sense would dictate an environmental impact statement into a proposed mine or development would be undertaken to assess whether or not the project should proceed -- a basic risk/reward assessment. But the EIS process in Queensland is actually designed to allow projects to go ahead with whatever conditions are necessary to mitigate and minimise the environmental risks. 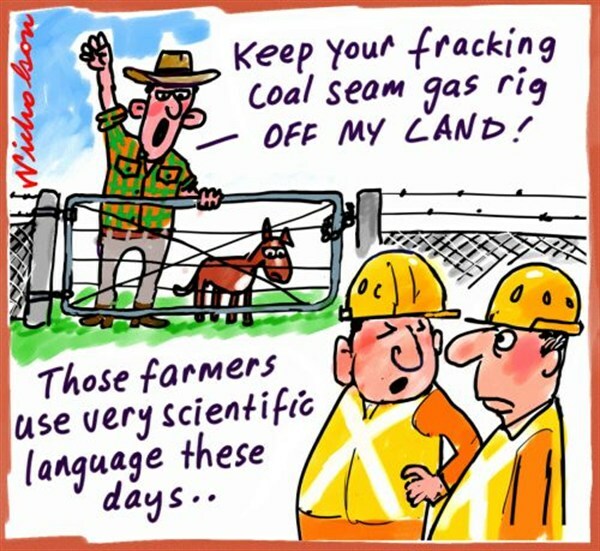 Farmers in the fertile Felton Valley in Queensland discovered their naivety about the purpose of the EIS when a coal mine and petro-chemical plant were proposed a few years ago. "We thought our case would be the first mine to be stopped by an EIS," farmer and former president of Friends of Felton Rob McCreath told Crikey. But local residents were shocked to discover no coal mine in Queensland has ever been stopped by an EIS and their prime food-producing farmland was not protected. "The mining companies draft the EIS terms of reference and employ consultants to write the EIS and, when it's approved, the company monitors itself," he said. "It's totally rotten. It pretends to be a process to decide if projects should go ahead or not. But it isn't." Mines and other developments have been awarded approval despite the EIS process, from national parks to at-risk and heritage-listed environments such as the Great Barrier Reef and even in the suburbs of cities, where gas miners are preparing to move in with drill rigs. And Queensland's vast coal deposits, combined with the discovery of methods for mining the coal seam gas in those deposits, has spawned a "gas rush". ABC's Four Corners this week exposed the pressure on Marsh to assess $38 billion in gas mining projects without having time or the basic data to make a proper assessment. Santos published full-page ads contesting her claims. · $76 million urban water supply Emu Swamp Dam at Stanthorpe. Assuming all the proposed significant projects go ahead, it's critical independent monitors be established to identify environmental damage caused by the simultaneous construction of onshore open-cut and underground mines and vast gas fields, pipelines and railway lines, port expansions and excavation of the seabed for shipping lanes and berths in several locations. Rob McCreath believes the public could have more confidence in the EIS process if companies proposing developments were forced to pay a fee to the government, which then could employ independent scientists to assess projects in the best interests of the public.